It feels like it's been a really long time since my last nail polish post- maybe because it has? But, I've got a few Sally Hansen Miracle Gel shades to share today. I've been testing these for a few weeks now, as I was quite curious to see if theses would last even half as long as promised- two weeks. Huh. Sound pretty good, but is it too good to be true? Read on for my verdict. Sally Hansen Miracle Gel is marked as being a gel polish that gives you prolonged wear, a glossy, durable finish, but without the need to cure under a UV/LED lamp. While you can do your own traditional gel polish at home, there are drawbacks- mainly the fact that you've got to soak polish off and from my experience is usually not a speedy process. The fact that you can remove the Miracle Gel like any other polish is definitely a plus. So, how do they wear? Really well! While I didn't get two weeks of wear, I did get 6-7 days with the three shades I tried, which is AMAZING for me. I don't know what it is, but I normally can't keep polish on my nails for more than 2-3 days before it chips. I've had success with some topcoats (mainly CND Vinylux) but results varied depending on what polish I used it over. Since the Miracle Gel system has a it's own topcoat, I couldn't help but test it with other polishes to see if it could prolong the wear of other polishes. While I didn't have the same 6-7 days with other polishes, it did give me, on average, two extra days of wear, which isn't too shabby. Tea Party is an icy, pale blue-green with soft, glowy, shimmer. The shade does read a bit too blue in photos, as it does have a slight green tone in person. The formula of this shade left a bit to be desired, as it's quite thin and prone to streaking. I used three coats, and while it looks pretty good, I can see areas where there is a bit of patchiness. Greyfitti is a medium, cool, grey cream. I love grey in general, but even more so in polish form. This shade is quite balanced, as it doesn't lean too blue. 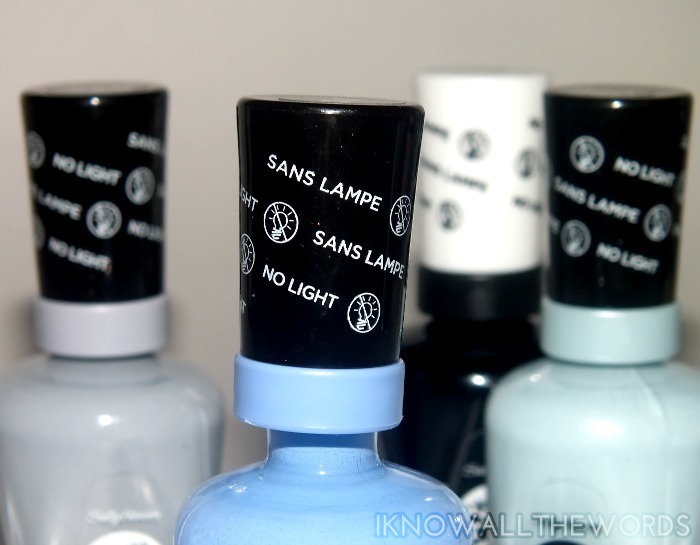 The formula was pretty much perfect, as it flowed easily onto the nail and was perfectly opaque in two coats. Sugar Fix is a slightly dusty, medium blue. This is dustier and a little bit more muted in person, but it refuses to photograph correctly. From the other swatches I've seen online, it seems like everyone has had the same problem. I have a few (too many?) blues in my collection, but I can't think of any that are quite this shade. It's defiantly a must have for blue lovers. Formula is a little bit thick, but not troublesome. Two coats. Overall, I'm really happy with these polishes! Granted, they're not the same a gel manicure, but considering you don't need a lamp, and the fact that you don't have to soak these off, there is little not to love. What do you think of these shades? Have you tried these polishes? Thoughts?